With all the hype and attention surrounding desktop managers such as KDE and Gnome you could be wondering "why bother using other window managers when those have got everything included in them?" Integrated file managers, nice shiny gadgets, etc. The answer is simple. Both KDE and Gnome take up vast amounts of memory, and if, like me, you have aging hardware, you often look for alternatives that will make your system usable. You might think that, as KDE and Gnome have everything the user ever wanted, why bother changing? Or to put it another way, is there some way that I can emulate some of what KDE and Gnome do, at less memory cost. The answer is "yes". One of the most requested features from users over the years has to be about the use of session managers, which is the focus of this article. Session management allows the state of applications that are running to be saved and remembered. This includes attributes such as the size of the windows, their geometry (location on screen), and which page/desk it was on (if you're using a virtual window manager which supports those). It works by the session manager handing out client-IDs. The application to which this is given to is usually the main window, and any other sub windows do not get any (these sub windows, we call transient windows), since they are event-driven specific and only show when such events within the application are triggered. However, the parent window has to register itself directly with the session manager so that the session manager knows the originating window so that any transient windows that can be attached. Such a window has a property called: WM_CLIENT_LEADER. This is used to talk to the session manager. A further property WM_WINDOW_ROLE is used by fvwm to define the state of the window. These underlying calls come from the X server itself, which communicates them to the window manager that is running. So a session manager is a program that handles these protocols, talking both to the underlying X server and the window manager to determine how these windows are to be setup. It is the job of the window manager, if running under a session manager, to communicate with the session manager to learn of these 'hints'. There aren't that many true session managers out there. But for those that do exist, getting them to work with fvwm can be a challenge. I shall look at each in turn and evaluate their performance. 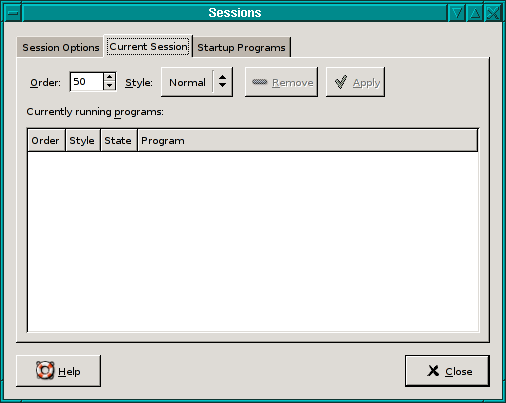 In order for fvwm to use session management, it must be compiled with --enable-sm at ./configure time. Once this has been done, you can use any session manager you like. Thus it allows the user to define separate definitions for instances where the user may or may not be using a session manager. It should be noted that if running under a session manager that it will only look for the SessionInitFunction (and related) sections, and will not run the InitFunction sections at all. It is also a bad idea to launch xterms and other applications from within the session functions since this can often interfere with the way that the window manager interprets how to handle the window. Making sure that "some_session_manager" above is replaced by the actual name of the session manager. smproxy is required since there are some programs which do not natively support the program calls that define session management. In such instances smproxy will try and sniff them out. This is pretty self-explanatory. By clicking on the 'Load Session' button, you can select previous sessions to load. When you initially start X, this is what you'll see. You can suppress this window, but to do so, you have to create a session. Figure 2, shows what is presented after everything has loaded. Using this window, you can get an idea of the applications that it already recognizes, and save the session etc. The only drawback with using xsm is it is very limited in the applications it can recognize. If the application is not strictly X aware then xsm will not be able to handle it. To save the state of you session (and hence to see whether xsm can identify any more windows, you can press the "checkpoint" button, to get a screen such as Figure 3. From here you can enter the name of the session that you want to save. I said earlier that you can by-pass Figure 2, by having it load up the session name of your choice. Once you have saved the session, edit the file: $HOME/.xsession and change the line: exec xsm to: exec xsm -session [name] where '[name]' is the name of the session. xsm also causes problems with fvwm in that you have to quit xsm in order to save the session, since xsm is the governing process. I found this to be quite annoying. I would however, recommend it to anyone who uses simple apps, or to someone whom only wants certain apps to run and doesn't want the hassle of install Gnome or KDE to use the session features that they have. Be advised that starting 'program1' and 'program2' above, before the session manager will cause two instances of the same program to load each time you fvwm again since it loads them as normal, and then the session manager will load them because it would have (hopefully) save their state. That's just something to bear in mind. When you login to X this time, initially Gnome will load up -- don't panic. The pain and suffering won't last for long. What we need to do is to replace sawfish or metacity (depending on whether you're Gnome1 or Gnome2) with fvwm, while keeping gnome-session running so that when we save the session it knows to load fvwm and not some other window manager. ...when run in an xterm might do the trick. If not, it will be a case of interfacing with gnome-session itself. Oddly enough, there is a Gnome application which provides this very interface: gnome-session-properties. This is a really useful application for tweaking the session manager. But for the purposes of getting fvwm running under it we have to explicitly remove either sawfish or metacity. Where [wm] above is either: metacity or sawfish. As soon as that has worked, save the session. It should be pointed out that for those applications that really aren't session aware, there is an option to have gnome-session launch applications, by using the 'startup programs' tab (figure 4). That's really all there is to setting up and using gnome-session with fvwm. This has been a very brief look at how different session managers can be used with fvwm. There are others out there such as KDE's ksmserver and XFCE4's xfce-session, but I have not tried them with fvwm and do not know what they are like. Session managers aside, there are also two modules of interest native to fvwm, namely: FvwmSave and FvwmSaveDesk. While these are not session managers, they do provide functionality very similar to them. These will be discussed more fully in other articles next month. I write the recently-revived series "The Linux Weekend Mechanic", which was started by John Fisk (the founder of Linux Gazette) in 1996 and continued until 1998. I'm also a member of The Answer Gang. I was born in Hammersmith (London UK) in 1983. When I was 13, I moved to the sleepy, thatched roofed, village of East Chaldon in the county of Dorset. I am very near the coast (at Lulworth Cove) which is where I used to work. I first got interested in Linux in 1996 having seen a review of it in a magazine (Slackware 2.0). I was fed up with the instability that the then-new operating system Win95 had and so I decided to give it a go. Slackware 2.0 was great. I have been a massive Linux enthusiast ever since. I ended up with running SuSE on both my desktop and laptop computers. 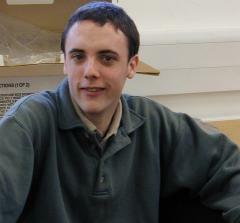 I am now 18 and studying at University (Southampton Institute, UK), on a course called HND Business Information Technology (BIT). So far, it's great. Other hobbies include reading. I especially enjoy reading plays (Henrik Ibsen, Chekhov, George Bernard Shaw), and I also enjoy literature (Edgar Allan Poe, Charles Dickens, Jane Austin to name but a few). I enjoy walking, and often go on holiday to the Lake District, to a place called Keswick. There are numerous "mountains", of which "Great Gable" is my most favourite. I am also a keen musician. I play the piano in my spare time. I listen to a variety of music. I enjoy listening to Rock (My favourite band is "Pavement" (lead singer: Stephen Malkmus). I also have a passion for 1960's psychedelic music (I hope to purchase a copy of "Nuggets" reeeeaaall soon). Copyright © 2004, Thomas Adam. Released under the Open Publication license unless otherwise noted in the body of the article. Linux Gazette is not produced, sponsored, or endorsed by its prior host, SSC, Inc.